Through Capoeira an art form comprising a mixture of mixed martial arts, dance and acrobatics, I met this vibrant energetic talent straight out of Parow Valley. 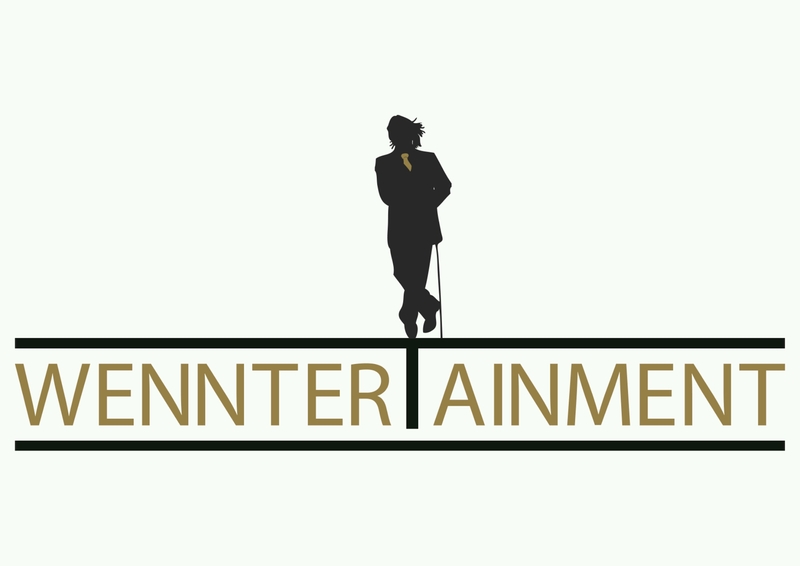 Julian Wenn – W E double N better known as the WENNtertainer, he is a full time musician “most of the time” but also has talents in other areas namely Acting, Singing (Tenor), dancing, MC and Hosting and recently added Wedding singing to the impressive repertoire of talents. Some of you may know him as the dreadlocked guy running on stage in SA Got Talent 2013 wowing the judges and audience with his original song “Love Is”. Blessed with many gifts he stays humble and gives back to his community by raising awareness about crime and initiating activities such as cleaning up the parks, pestering counsel to maintain the sports ammenities as well as organising and chairing meetings, he also teaches Capoeira in the Stellenbosch area. He has many accolades on his CV which is impressive from Hosting a Children’s Game Show in Dubai to presenting a show on KFM. His dream is to use his gifts for the greater good and thats alotta gifts and from the looks of things he is going to fly. Catch him at Visual Impact Cape Town Media Hive No 1Glynnville Terrace Gardens Cape Town on Friday 8th May at 6pm for 7pm to be blown away by the PREMIERE OF THE” Love Is ” music video. This entry was posted in Uncategorized on April 30, 2015 by shaunjengel. Moravian Hill rich in the history of moravian teachings, this was the venue of the travelling exhibition commemorating the 600th anniversaryand burning at the state by the Council of Constance. In 1415, the Council of Constance, organized by the Roman Catholic Church between 1414 and 1418, sentenced Jan Hus (John Huss) to death. He was born in Bohemia in central Europe. The Council thus attempted to reunify medieval theology by condemning the then radical branch of Christianity represented by Jan Hus. This attempt, however, turned out to be traumatic for the Catholic Church. It lost power in central Europe, particularly in Bohemia, where the citizens were ready to spend their whole lives defending Hus’s legacy, even if it cost them their lives. The exhibition was well attended by the Moravian community, to be honest I came late as I had another event to attend but from what I saw it was interesting as a recollection of the history of Jan Hus were displayed along the side of the church, speeches were made and the brass band performed a few items. After the event the people could discuss what was read and just catch up with old friends and meet new ones, we met the ambassador from the Czech Republic and a new friend from Germany, an exchange student teaching in Cape Town. We also learnt something about Jan Hus from one of the theology students of the Moravian Seminary, Jan was the rector of the University of Prague – I guess the more you know the more you are in a position to challenge. Daar was ook ‘n lekker warme koppie koffie en snacks, die Morawiese gemeente weet mos hoe om te entertain :-D.
This entry was posted in Uncategorized on April 28, 2015 by shaunjengel. Have you ever just stopped and looked up at the night sky and watched the stars? 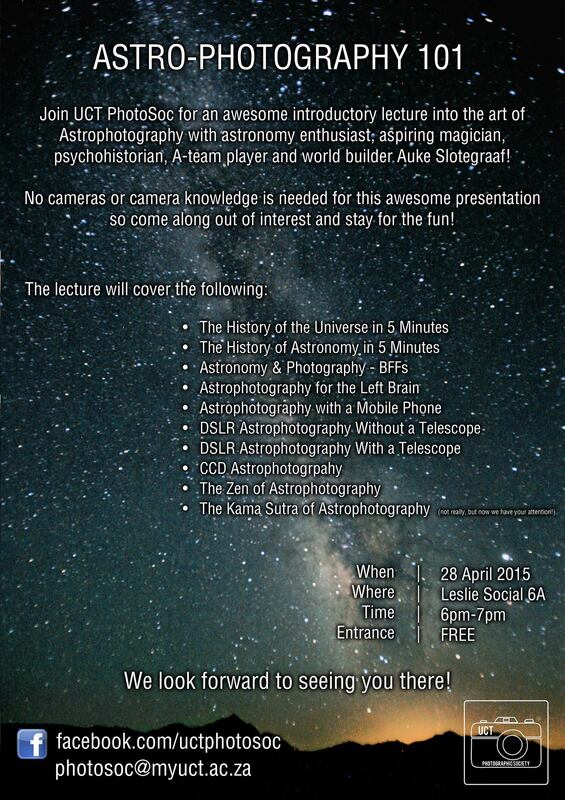 Today I attended a lecture on Astrophotography 101 not knowing anything about this, all I knew was that Astro are those colourful chocolate things and photography is well taking pictures – put the two together and you taking pictures of Astro’s :-D.
Nah just kidding what got me was the last point on the presentation list – The Kama Sutra of Astrophotography hahaha yes they got my attention. 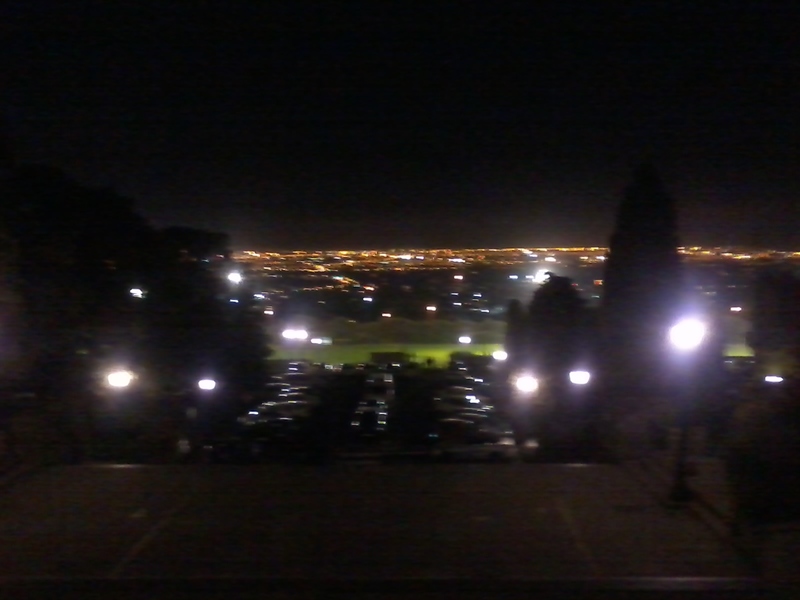 The lecture was held at UCT to me this is like Hogwarts and today it was as we got lost trying to find the lecture theatre only to find it moved, this resulted in us missing a few minutes of the lecture o_O. I bet you thinking what the Kama Sutra of Astrophotography is right, well I’m still trying to figure out what this is from what I saw though in the pictures some of the stars had tails from the way the earth moves – yeah stop thinking what you thinking thats dirty hahaha. wicked ways, then I will hear from heaven, and I will forgive their sin and will heal their land. Today South Africa celebrated Freedom Day, 21 years of Freedom still facing some of the same struggles we faced 21 years ago but I am positive that even though we are going through these struggles we as a nation can overcome them together. Today though it was something different that can change the world something more powerful, this is the power of PRAY, praying together a nation united. The Newlands Stadium was filled with young and old, people from different races, denominations, countries and backgrounds all united through PRAY to make a change and also just say THANK YOU for our freedom. We heard confessions and revelations of the mighty power of THE LORD through pray, the lives that were changed, from drugs, gangsterism and other ills that face our youth – we were inspired through the passion of these stories and witnessing first hand the change in these peoples lives. It was an eye opening and inspiring event, one that brought a city together holding hands, despite the violence and heartache outside we stand united as Cape Town – together through PRAY we can heal a nation. This entry was posted in Uncategorized on April 27, 2015 by shaunjengel. I did the moonlight mass and NAKED bike ride before. I did a couple of 10km races before, I also participated in a swimming gala in primary school – That makes me a perfect candidate to become a TRYathlete right o_O. 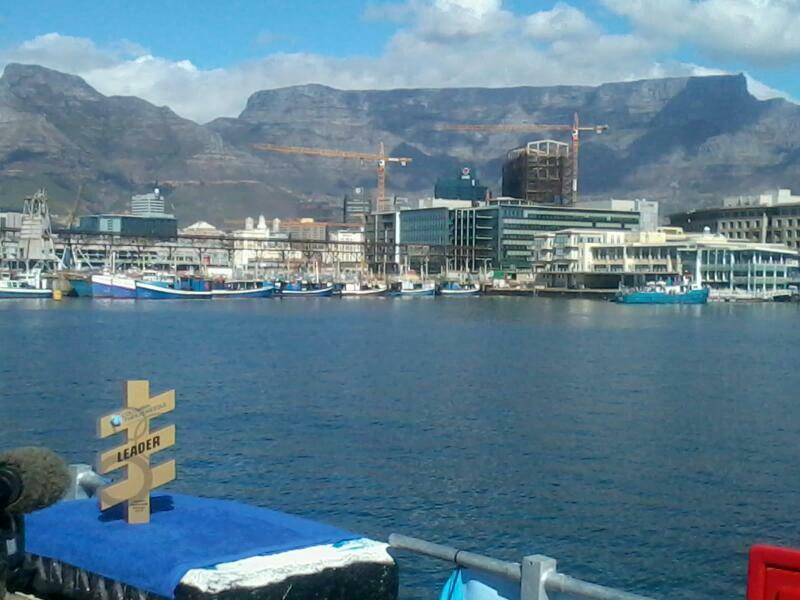 I opted to be a spectator to the Discovery World Triathlon Series Cape Town, a ten city tour around the world with Cape Town, South Africa being the 4th stop. 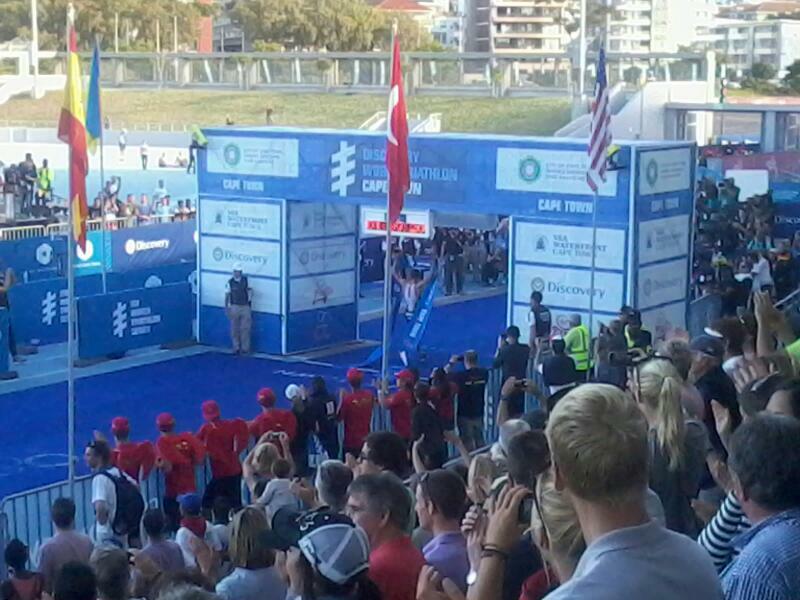 I was kinda sussing out my competition so to say haha, from what I witnessed these Elite men Tri-athletes must be superhuman. 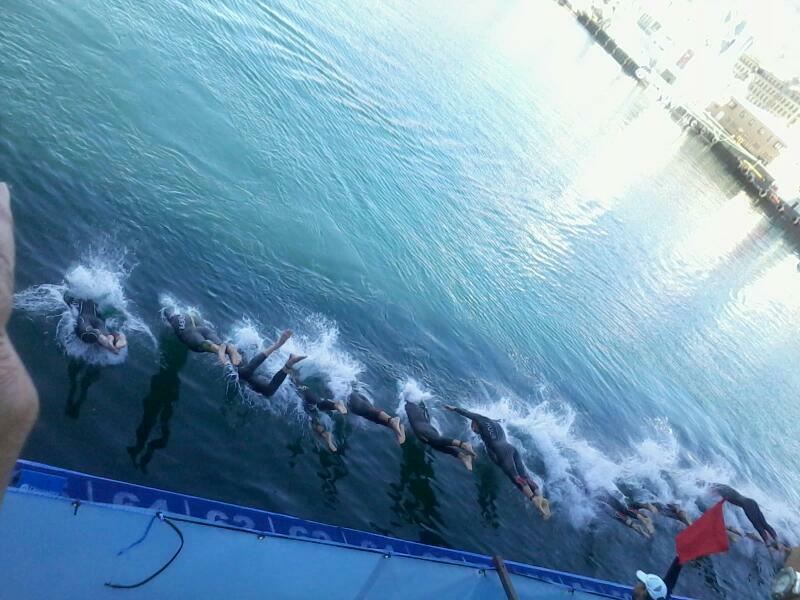 The average speed during the swim is 60 seconds per 100m, the average speed during the cycle is 40km/h and the average speed during the run is 3min/km – see what I meant by superhuman athletes. Cape Town welcomed the top Elite men and Women to participate in arguably one of the most scenic and spectator friendly triathlons in the series, the swimming distance was shortened due to 750m due to water temperatures being too cold, this just added to the excitement of the day making it a faster, nailbiting event. With Great Britains, Vicky Holland taking the elite womens crown yesterday it was up to Allistair Brownlee to keep the flag flying high today, 2012 Olympic gold medalist you would think this to be easy right…not with Javier Gomez Noya and homegrown favourite Richard Murray on the course with you though. 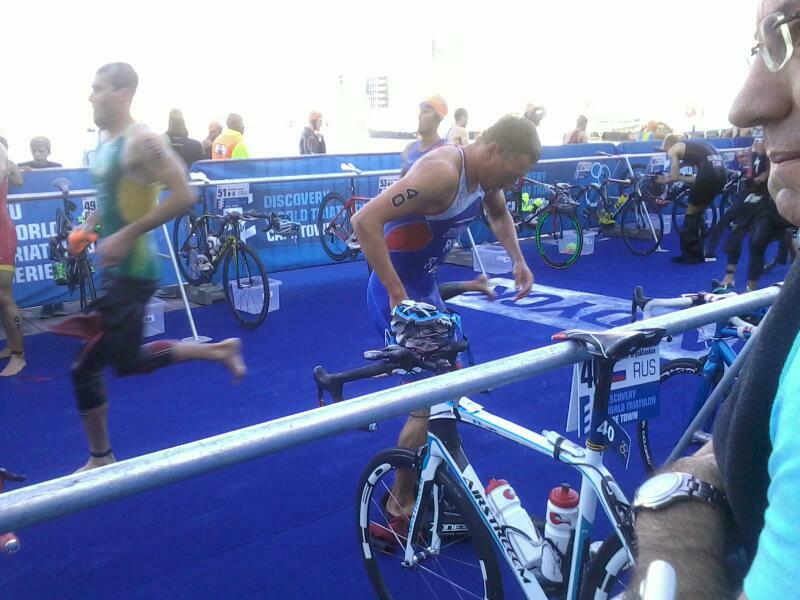 The swimming leg saw all athletes finish in a bundle congesting the first transition section – this went off smoothly under 60 seconds and they are off cycling its amazing to witness. 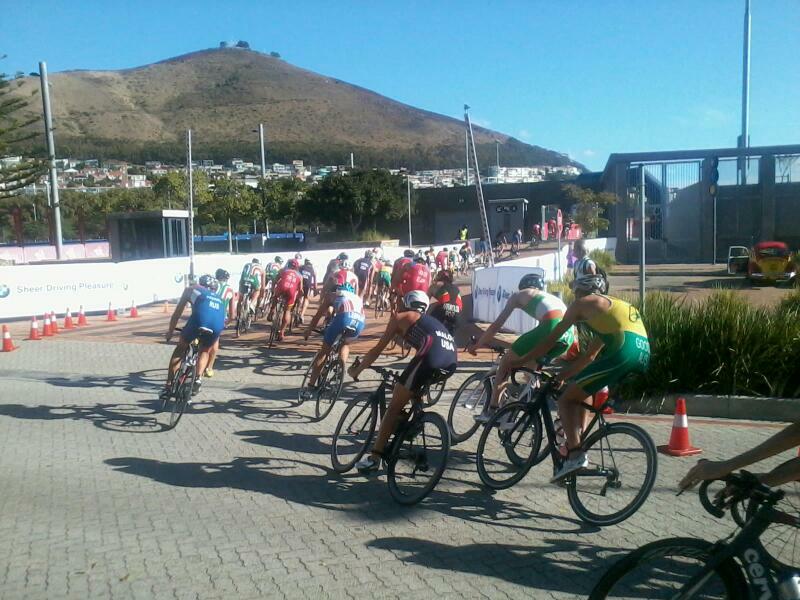 With all spectators running towards the new revamped Greenpoint Athletics track I felt like a tri-athlete myself, inside the stadium atmosphere was electric as we cheered on the athletes during the 40km cycling leg of 8 laps through the stadium. It was during the 10km run that the real action started, what an intense 30 minutes this was as the athletes started to make a break it was local hero Richard Murray who led the pack for a while everytime they came through the stadium it erupted with cheers :-D…- I guess nothing beats experience though as in the last lap Allistiar and Gomez broke away opening up a huge gap to continue where they left off in the Olympics finishing one and two respectively with French Athlete, Vincent Luiz overtaking Murray to take 3rd place. What a win for Brownlee who celebrated his 27th birthday on Thursday an awesome birthday present indeed but Gomez is still the lead athlete in the series. This entry was posted in Uncategorized on April 26, 2015 by shaunjengel. Exploring visions of freedom through poetry, music and dance. 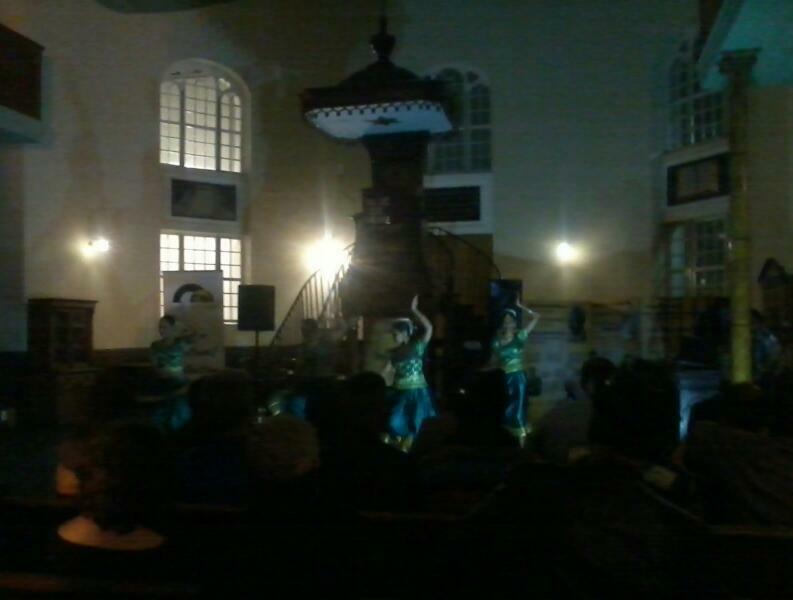 With Freedom day just days away the The Cape Cultural Collective and the Sendinggestig Museum treated us to a night of reflection through different art forms, from Bollywood dancers, deep rooted poems and soul enticing music this was definitely a evening of true reflection. 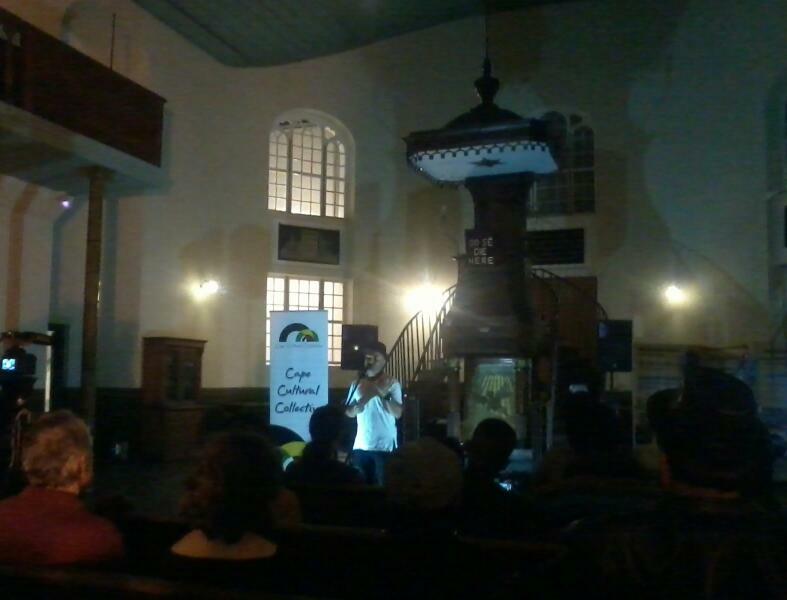 There was a time when we as South Africans could not gather like we did tonight, freedom was something we could only dream about, I say ‘we’ as I believe myself to be African not part of the struggle per say but definitely affected by the influence of the years our forefathers fought for our freedom. I acknowledge their sacrifice and appreciate the fact that I can be a part of such a gathering. 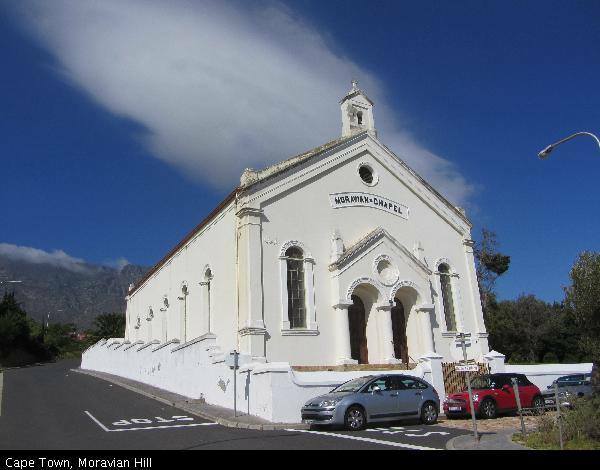 In the light of the recent Xenophobic attacks in our Country it was moving to see so many gathered to appreciate the immense local talent Cape Town has to offer. I have been to a few poetry sessions and I must say a poem is always more powerful when read out by the artist themselves, only they would know how to convey the correct emotion thought out through their poem. Byron Clarke and Salim Ismail gripped the audience with their soulful voices and talent on the guitar, the energy was invigorating as we clapped and sang along to popular renditions of ‘Thinking out loud’ – Ed Sheeran , ‘Say Something’ – Christina Aguilera and Alicia Keys – ‘No One’. 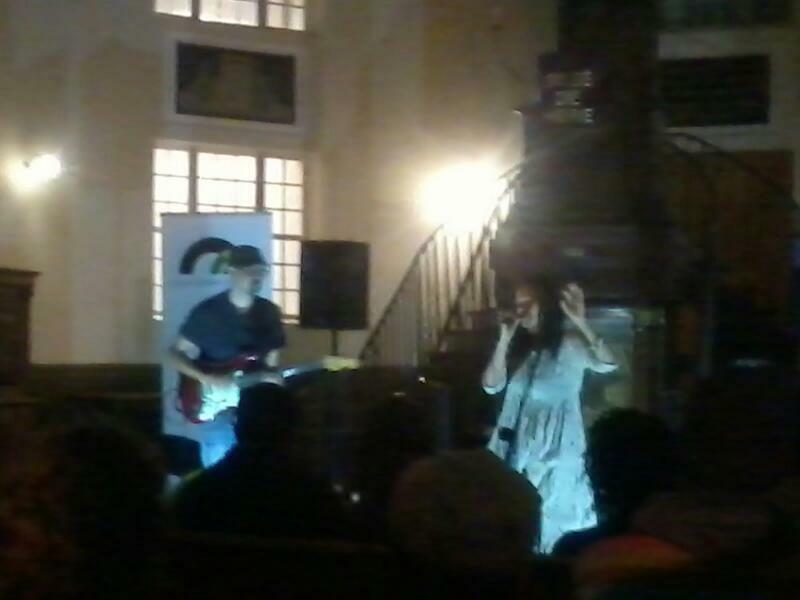 It was Ernestine Deane who closed off the evening with her unforgettable voice – a vocalist of phenomenal talent and lyricist inspired by the stories of Cape Town, South Africa and the everyday human experiences of love and life. With such an array of local talent in our country we should be blessed and honoured to have the opportunity to call ourselves South African, we should embrace our freedom and also respect the freedom of others through love and life we will make this a better place for all. This entry was posted in Uncategorized on April 25, 2015 by shaunjengel. 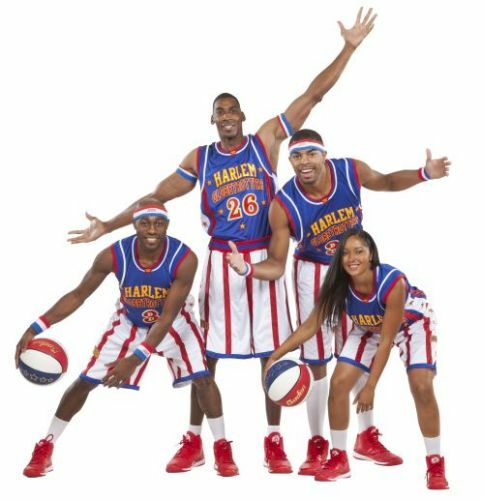 The Harlem Globetrotters are coming back to South Africa – Do not know who they are? Then you must be from Antarctica as this is the only continent they haven’t performed on……yet o_O. combines athleticism, theater, and comedy. If you want to see Space Jam in real life watch the Globetrotters in action they will amaze you with their crazy skill with a basketball and sure to entertain a packed crowd in South Africa. What do we expect I am not sure, all I know is the show is going to be full of energy, 2 hoops and many basketballs, top quality athletes both men and women trained in the art of entertainment and basketball and proud to be called Harlem Globetrotters ready to put on the show of a lifetime not to be missed, even Lionel Messi was drafted as a Globetrotter hmmmm I guess size does not matter o_O. Expect backflips, frontflips slam dunkin, three pointer trick shots galore – you going to leave the arena and think, “I wish I was a little bit taller, I wish I was a baller” – I believe I can fly might be a dream for some of us, for these athletes it is a reality they are the superheroes of basketball. Hoop there it is….High flying in your face basketball entertainment. 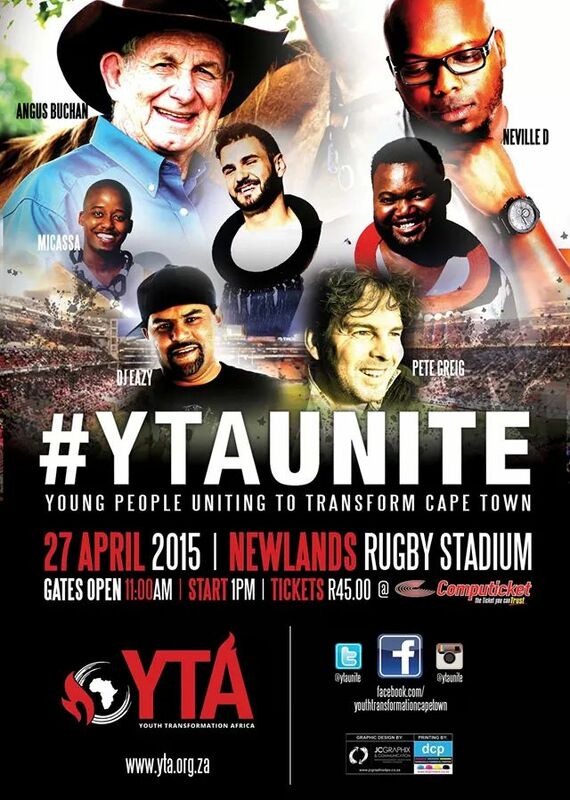 Get your ticket soon to avoid disappointment for it is sure to be a packed arena. This entry was posted in Uncategorized on April 22, 2015 by shaunjengel.